Many knew Henry as the kind of fellow who ran footraces, told self-deprecating jokes, and made everyone feel comfortable. Some of those memories are recorded here in the form of audio, video, and photo clips. They capture Henry Eying’s legacy of goodwill and good humor. Read The Faith of a Scientist and Reflections of a Scientist on Fold3. See pictures collected from the life of Dr. Henry Eyring. Watch a video about one of Dr. Henry Eyring’s famous footraces. 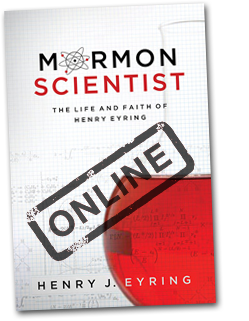 Watch a video interview with Harden Eyring, Dr. Henry Eyring’s youngest son. Read the KIDK story about Henry J. Eyring.